This article was sponsored by WRLD 3D. Thank you for supporting the partners who make SitePoint possible. The following takes place between 7:00am and 8:00am, on Christmas Eve. Events occur in real time. For all our data-gathering capabilities, we’re still hopeless when it comes to visualising that data in the 3D world we live in. We stare at 2D charts and log entries, but much of the data we pluck out of the world has meaning in a 3D context. And, it can be useful to visualise this data when it is applied back into a 3D model. This is the problem Augmented Reality seeks to solve. In contrast to the fictional environments of Virtual Reality, Augmented Reality can help us solve many real problems; by applying the data we would otherwise consume through a 2D medium to the real world around us. Mapping is the first-born amongst Augmented Reality’s children. When WRLD approached us, to write about their platform, I was immediately taken by their platform’s graphics and performance. Yet, the more I use their platform; the more I am fascinated by the usefulness of their API and fidelity of their mapping data. We’re going to publish a series of tutorials, which demonstrate how to use this platform to bring information into the world it applies to. Each tutorial is themed according to a popular T.V. show. As you may have guessed, this first one is about 24. 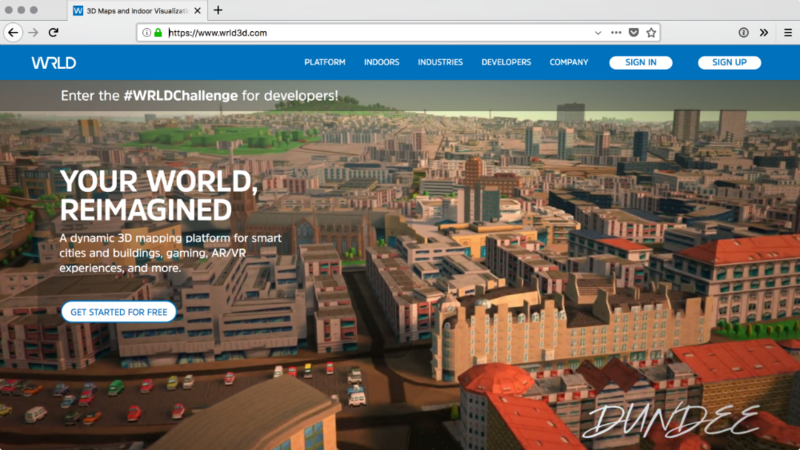 In this tutorial, we’re going to learn how to get started with the WRLD platform. We’ll follow the documentation examples to render the simplest map. Then, we’ll create a local environment for compiling our code; and start to tell a story with it. The code for this tutorial can be found on Github. It has been tested with a modern versions or Firefox, Node, and macOS. The easiest way to get started is to follow the first example, in the documentation. Before we can do that, we need an account. Head over to https://www.wrld3d.com and click “Sign Up”. Once you’re logged in, click “developers” and “Access API Keys”. See the Pen Getting started with WRLD by Christopher Pitt (@assertchris) on CodePen. WRLD.js is based on Leaflet.js, which makes it familiar to anyone who has done a bit of map-based work before. It also means the maps are mobile-friendly and interactive. Click and drag, with the left mouse button, to pan around the map. Click and drag, with the right mouse button, to rotate the map. Click and drag, with the middle mouse button to change the perspective angle. Scrolling the mouse wheel will affect the zoom. The map can also be controlled on touch devices.